Oahu Cemetery is unique among cemeteries in Hawaii for many reasons. Foremost, it is the final resting place for hundreds of well-known individuals and families, captains of industry, musicians, scholars, artists and government officials. Among Oahu's famous permanent residents are: Alexander Joy Cartwright, Jr. the father of American baseball; world renown anthropologist, Kenneth Emory; internationally recognized artist, Jules Tavernier; world renowned mythologist, Joseph Campbell; sugar barons James Campbell and Benjamin F. Dillingham; Hawaiian musicians Sonny Cunha, Johnny Noble and Charles K.L. Davis; internationally recognized botanist Joseph Rock, and Hawaiian historian Samuel Kamakau. 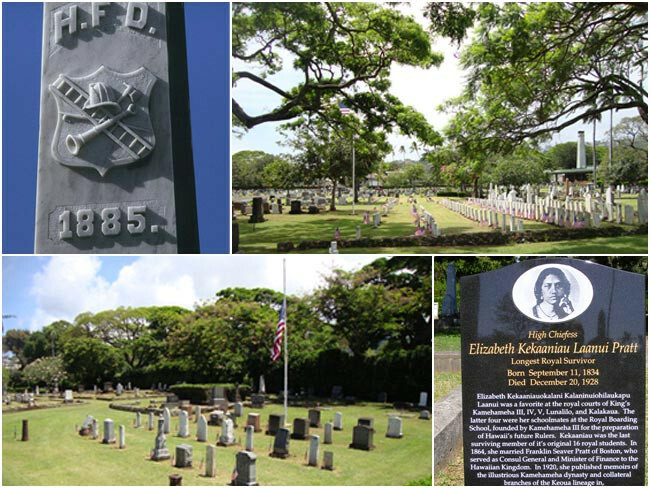 Also interred here are; Thomas Thrum, author of Hawaii's first Hawaiian Almanac; and Henry Bond Restarick, first Episcopal Bishop in Hawaii. In addition, six former governors and five former mayors are resting peacefully here.